The newly renovated barn on a farm in a restful setting has stunning views over the historic town of Clogher and Slieve Beagh. It retains much of the original stonework in its interior, but has been tastefully furnished and fully equipped to provide comfortable accommodation for 4/5 people. Enjoy a restful stay in a tranquil rural setting in the picturesque Clogher Valley, while Fermanagh Lakeland and the Sperrin Mountains are within easy reach. This is a central location for visitors wishing to tour Northern Ireland and the scenic counties of Donegal, Monaghan and Sligo. 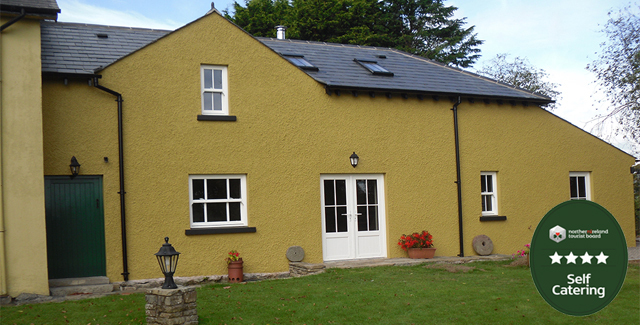 The Homecoming Barn is in an ideal location just 1 mile from Clogher and the A4 Belfast to Enniskillen route. Only 70 minutes from Belfast and 90 minutes from Dublin airport. Genealogical consultancy is available as an optional extra for those who wish to take their search beyond the existing internet sites. Mr Johnston has particular expertise in the Clogher Valley and border counties. We have free wifi available to all customers throughout the barn. Our accommodation will provide comfortable accommodation for 4/5 people. ………..….we walked in the evening round Castle Hill….it is very high, and a fine meadow around the sides of it, where we sat an hour on the haycocks, refreshed by the fragrancy of the hay and the sweetness of the air, till the setting sun warned us to bend our footsteps home.